Cooks well, looks smart, and features well labelled touch controls. May be slightly too small for larger families. Looking for a reasonably priced compact grill microwave? The Sharp R662SLM is ideal for those on a budget who are looking to buy a grill microwave, with a 20 litre capacity and 1000w powerful grill built in. The design is fairly modern, with a rounded curved handle which you'll ever love or hate. In use it feels comfortable and sturdy - no complaints from us. The touch panel buttons are very clearly labelled, which is a nice bonus compared to some symbol based menu systems we've encountered. Overall our testers were complimentary about the silver and black design and controls - it is pretty easy to operate and not too long winded to put into operation. In terms of size, the R662SLM is fairly compact, with the exterior measuring 43.9cm by 25.7cm by 35.8cm and the interior being 30.6cm by 20.8cm by 30.6cm. Inside they've crammed a 25.5cm diameter turntable, which is removable for cleaning. Overall weight is fairly light too, being just under 11.5kg. 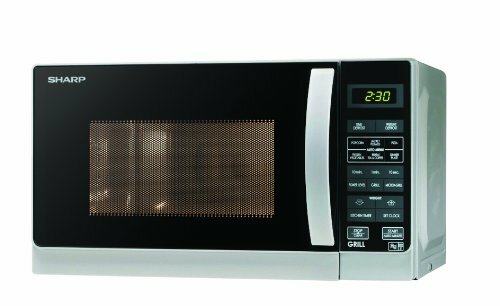 11 Different Microwave power levels are featured, which go up to a maximum of 800w, and the timer reaches a total of just over 99 minutes, which should be ample for the majority of recipes. In use, the display is fairly bright, and easily legible in the majority of lighting environments. It heats up fast, and coped with everything from slow cooking casseroles to quick re-heating tasks with ease. The interior wipes cleaning fairly easily, and after a few weeks of testing the Sharp R662SLM still looks as good as new. All of our testers agreed that the Sharp R662SLM offered good value and features for the money - the only minor issue that we have with it is if you have a very large household, then you may wish to buy a grill microwave which offers a slightly larger capacity. However for most small and mid sized families, then it will serve you well. If you looking for a compact grill microwave, then we'd highly recommend the Sharp R662SLM. It's simple to operate, easy to clean, and feels well built, featuring a powerful 1000w grill and 800w microwave. Overall, it's a high performing mid capacity grill microwave, and one which we'd recommended! Does it have stainless steel inside? The interior is finished in a grey colour scheme, and from what we gather is made from ceramics instead of stainless metal – it is pretty easy to clean though – hope this helps!